With this Cranberry Coffee Cake Recipe you can use leftover cranberry sauce or canned whole berry cranberry sauce. The tartness of the cranberries and subtle hint of almond are combined with a sweet confectioner’s sugar glaze to give this cranberry coffee cake a tasty mix of flavors. The addition of sour cream makes this coffee cake especially moist. To make this coffee cake look even more appetizing, swirl the cranberry sauce partially through the batter and top it with pecans. 1. 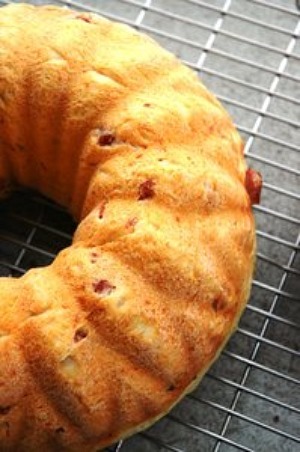 Preheat oven to 350 degrees F. Grease and flour a 10-inch Bundt pan or tube pan. 2. Heat cranberry sauce in a small sauce pan or in the microwave just until warm. If sauce is especially thick, mix with a tablespoon of water to make it a little thinner. Set aside. 3. In a large bowl, with mixer on medium speed, cream the butter. Gradually add the sugar, beating until light and fluffy. Add eggs, one at a time, beating after each addition. 4. In a separate bowl, combine flour, baking powder, baking soda and salt. Add this flour mixture to creamed butter mixture alternately with the sour cream, beginning and ending with flour mixture. Stir in almond extract. 5. Spoon half of the batter into pan. Spoon half the cranberry sauce on top of the batter. Swirl the cranberry sauce partially through the batter using a knife. Spoon the remaining batter into pan. Spoon the remaining cranberry sauce over the batter. With a knife, swirl the cranberry sauce partially through the batter. Sprinkle with pecans. 6. Bake cranberry coffee cake for 50 to 55 minutes. Coffee cake is done when a toothpick inserted into the center comes out clean. Remove from oven and let cool for 10 minutes before removing from pan. Invert coffee cake on to a serving plate. 7. Prepare the glaze. In a small bowl, combine confectioners’ sugar, water and almond extract. Stir well until blended. Drizzle glaze on coffee cake. Serve warm or at room temperature.